slate roof with lead rolls to ridge and hips. Axial stacks and renderd stafts. front range is probably the original early C18 range much remodelled. columns to front and single columns to rear, triglyph and guttae frieze and cornice. windows are blind, blocked from within. Second floor has early C19 9-pane sashes. windows are C19 12-pane sashes. The second floor windows are C19 9-pane sashes. 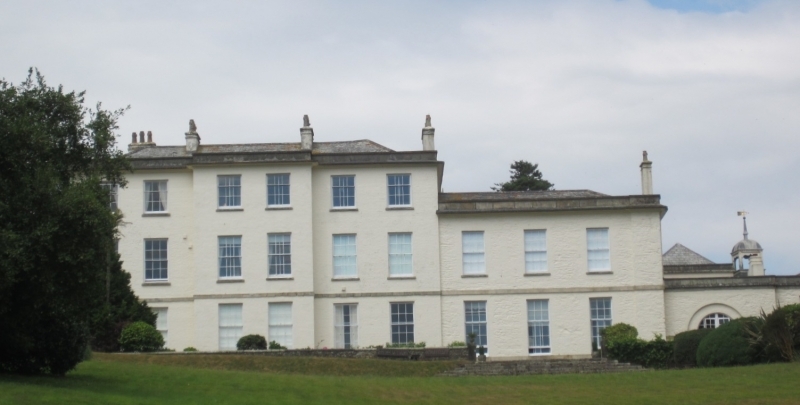 bays to right may be of C18 build, with segmental arches to the ground floor windows. first floor landing has a cast iron lattice screen with fluted Composite columns. appears to have been much remodelled when divided. family until C20. The Reverend H.H. Tremayne extended the house in the early C19. Sources: Pevsner, N.: Buildings of England: Cornwall 1970.